4-Methyl-N-methylcathinone (mephedrone) is a popular new psychoactive substance (NPS) that is structurally related to the parent compound cathinone, the β-keto analogue of amphetamine. Mephedrone appeared on the street drug market as a substitute for 3,4-methylenedioxy-N-methylamphetamine (MDMA, ecstasy) and was subsequently banned due to the potential health risks associated with its use. Nevertheless, mephedrone continues to be widely consumed among specific populations, with unique patterns of misuse. To date, most information about the biological effects of mephedrone comes from user experiences, epidemiological data, clinical cases, toxicological findings, and animal studies, whilst there are very few data regarding its human pharmacodynamics and pharmacokinetics. This chapter reviews the available published data on patterns of mephedrone use, its acute and chronic effects, and its pharmacokinetic properties. 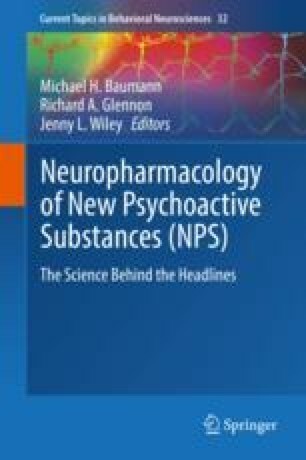 More human research is needed to elucidate the safety, toxicity, and addiction potential of mephedrone and related NPS. This work was supported in part by grants from Instituto de Salud Carlos III (ISCIII, FIS-FEDER PI11/01961; Red de Trastornos Adictivos-RTA-FEDER RD16/0017/0003 and RD16/0017/0010; Juan Rodes fellowship JR16/00020) and The European Commission (Drugs Policy Initiatives, Justice Programme 2014–2020, Contract no. HOME/2014/JDRU/AG/DRUG/7082, PREDICT Project).